The Fargo Air Museum was established in 2001 as an organization that promotes interest in aviation through restoration, preservation, and education. 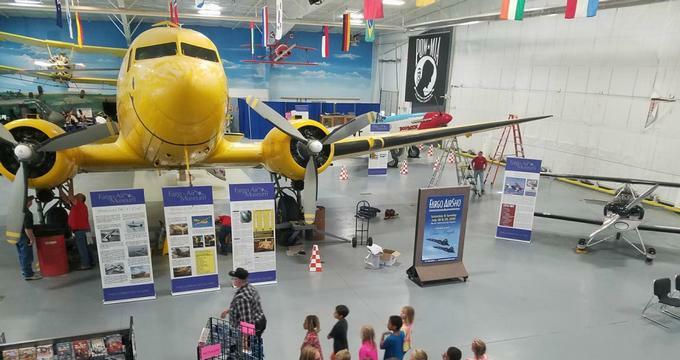 The North Dakota museum is an excellent place for those interested in aviation to learn more about aviation history, participate in restoration, host special events, and see full-scale aircrafts from history. The premiere destination for aviation in North Dakota, the museum houses a variety of aircraft from different eras. These pieces range from the Global Hawk reconnaissance unmanned drone, featuring an astonishing wingspan on 100 feet, to the most accurate replica of the Wright Brothers' Flyer. As a "flying" museum, several of the aircraft at the Fargo Air Museum take to the sky on occasion. This a unique museum feature that Isn't found in the majority of other air museums throughout the United States. Much more than a space that displays several airplanes, the Fargo Air Museum is home to one of the largest aviation libraries in the Midwest in addition to showcasing exhibits and military memorabilia. The museum also hosts seminars, speakers, and educational day-camps for aviation fans of any age to enjoy. There is also an expansive gift shop at the museum, featuring something for any enthusiast of aviation, including souvenirs, toys, clothing, home décor, jewelry, DVDs, books, and many more items. The Fargo Air Museum provides a rare chance to view two hangars full of aircraft from a variety of historical eras. The majority of the airplanes are still in good enough condition to take to the sky, exciting guests when they hear the roar of an aircraft's engine on the ramp. Visitors are welcome to explore the museum on their own, or schedule a tour led by a veteran pilot guide. Audio tours are also available to visitors wanting to learn more about aviation's legacy or featured airplanes. Among the many aircraft housed at the Fargo Air Museum is the North American P-51 D Mustang, possibly the most well-known fighter plan of WWII. It quickly rose to be a dominating fighter plane in the war with its Rolls-Royce Merlin engine, and was called a "knight in shining armor" by bomber crews. Another special aircraft guest can see at the museum is the Northrop Grumman RQ-4 Global Hawk. The unmanned surveillance aircraft can survey up to 40,000 square miles daily. The Wright Flyer at the Fargo Air Museum is a replica built in 2003, and considered to be one of the country's best replicas. The 1902 Glider designed by the Wright Brothers led to the creation of the Flyer. The Bell UH-1 Iroquois, first known as the HU-1A or "Huey," is among history's most successful helicopters. First used in 1956, the helicopter was mostly used for aerial attacks, cargo transports, medical purposes, and to transport troops. The B-25 Mitchell, a twin-engined American bomber, can also be seen at the museum. The aircraft got its name from Major General William "Billy" Mitchell, considered widely as the father of United States military aviation. The aircraft descends from the XB-21 project from the mid-1930's.